The word of the day is Encouragement. A simple word that has so much meaning to the person it is directed at. I grew up in a family devoid of encouragement. Now don’t be all sad for me, I figure I turned out great mainly because I like to encourage others in all faucets of life. In my *real world* job, I am a tremendous encourager to *newbies* in my field. 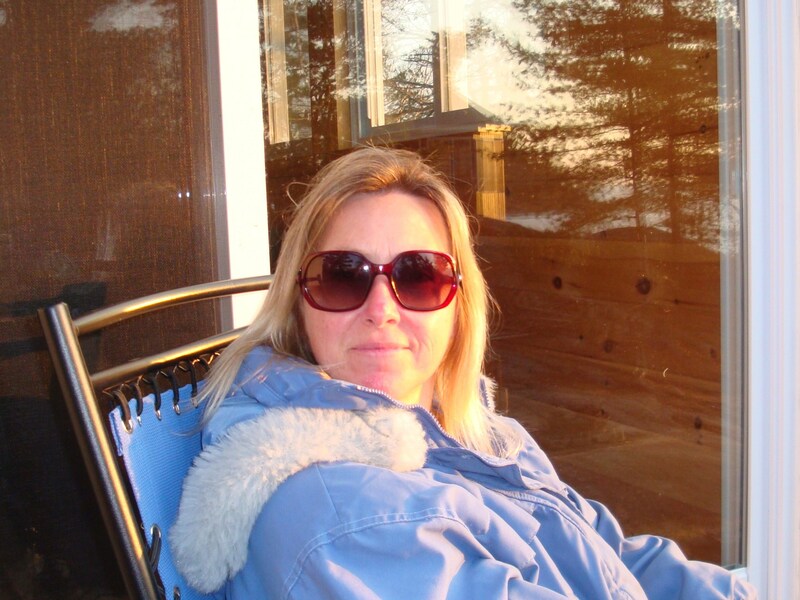 I find it satisfying to help others start out in the crazy real estate business and encourage them to do their best and to always think of their clients first. Mentoring is something I encourage everyone to do at least once in their life. I encourage my kids to do the best they can in whatever they are doing, whether it is my daughter trying new and exciting (and scary) knitting patterns or my son with a new job field. I am not religious by any means, but the sentence and reference above has the ability to empower a person. People that don’t pass along their knowledge and encouragement are scared of being forgotten. They think that only themselves can utilize their knowledge and no one else is qualified. Rubbish I say. Anyone and everyone can benefit from encouragement. Take the time today to encourage someone. Whether it is a child riding a bike for the first time, a new co-worker, or a first-time very worried and frazzled mom. You will be surprised how good it makes you feel. I love leftovers. In a pinch, they are a quick meal heated up the next day, but they also have tremendous experimental appeal for the adventurous kitchen types. I am just such a type. The other day we had shredded beef tacos with rice for dinner and I was left with about a cup of brown/wild rice and about a cup of the beef in BBQ sauce to ponder what to do with for last nights meal. I didn’t want tacos again so grabbed a couple frying pans and some veggies from the fridge and got to work. I also had one plantain left that was getting too ripe to be successfully sliced and baked into chips, but would work awesome sauteed with some butter and olive oil. I sliced up some green pepper, half a jalapeño, some green onions and a couple tomatoes. I sauteed the onions and peppers for a few minutes in some olive oil, added the tomatoes and leftover rice with a few shakes of ground chipotle chile powder, not enough to blow the roof of your mouth off, but enough to give it some zing and flavour. Add some fresh cracked black pepper and sea salt and that dish was pretty much done. 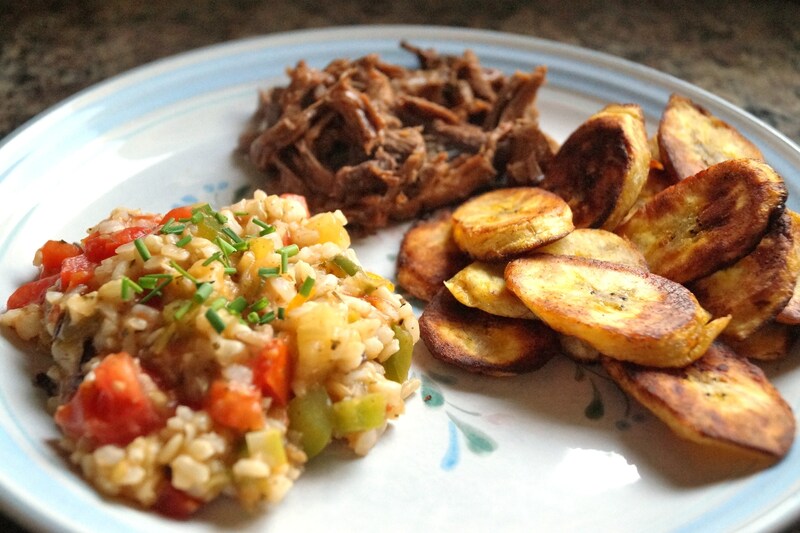 The beef I just reheated, but the plantains were actually the star of the show. I sliced the plantain on the bias and tossed the slices into a hot skillet that was sizzling with a pat of butter and olive oil. Cooking over medium-low heat, turning often until both sides were crispy and brown, I then drained them on a paper towel and plopped them on the plate. I heaped the rice mixture onto the plate topping with some fresh chopped chives along with the reheated beef. It ended up being a very tasty dinner utilizing random ingredients from the fridge to supplement the leftovers. I now wish there were leftovers of the leftovers! Pop up the patio umbrella, fluff the pillows on the chaise lounge poolside and fill me up a frosty glass with a delectably cold summer drink. The past couple days has seen the mercury soar into the mid to high 80′s with plenty of humidity to make sweat circle patterns, like crop circles, on the patio table from ice cold glasses. We had the most miserable, long, cold, despicable winter weather in memory and I for one am LOVIN’ the return of some heat! The first person to whine about how hot it is gets a slap upside the head and their cold drink taken away. With the return of heat, patio weather has also officially arrived. 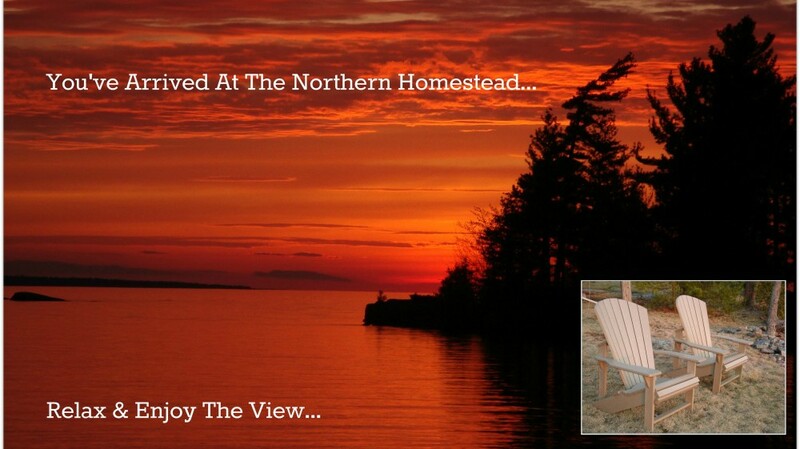 Just in time too as I have been thinking of new and fresh ideas in food for entertaining with backyard BBQ parties on the horizon. Something bite-sized and easy to handle that won’t slop all over the ground to invite any unwanted ants to the party. This past weekend I was up at the Northern Homestead and I noticed my chive plant was in serious need of a trimming. So I hacked off a good handful, wrapped it in paper towel and popped into a ziploc for the trip home. Then I got to thinking… just what was I going to do with them?…..Hmmm…what goes good with chives? Cheddar of course! But I wasn’t in the mood for a fattening, heavy muffin. I was going to have to think on this for a day or two amongst my busy schedule of home reno touchups (yes, we are still in the throes of a torn apart house, hence the sparseness of my posts of late). On Sunday, as I was working a pizza dough on the counter for dinner, an idea hit me. 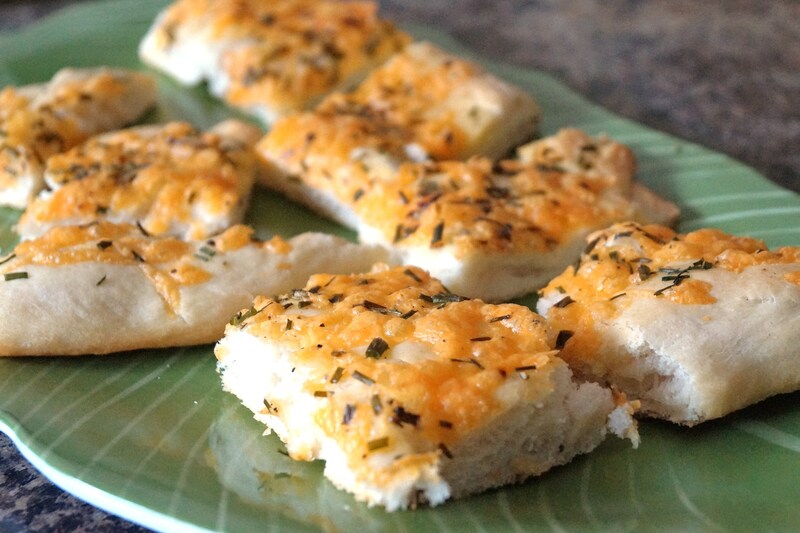 Why not make a cheddar and chive flatbread appetizer? Fab idea if I do say so myself. I just needed to find the time to get it done before my chives withered away in the fridge. So today I managed to squeeze out an hour or so to implement my idea, with minimal ingredients (always a bonus in my book) as well as giving Black Beauty (my KitchenAid stand mixer) a well needed run, she was feeling sorely neglected of late. In a medium sized bowl, sprinkle the package of yeast over the warm water and let *bloom* for about 10 to 15 minutes. Meanwhile, in a large bowl (or stand mixer bowl), combine the flour, baking powder and salt. 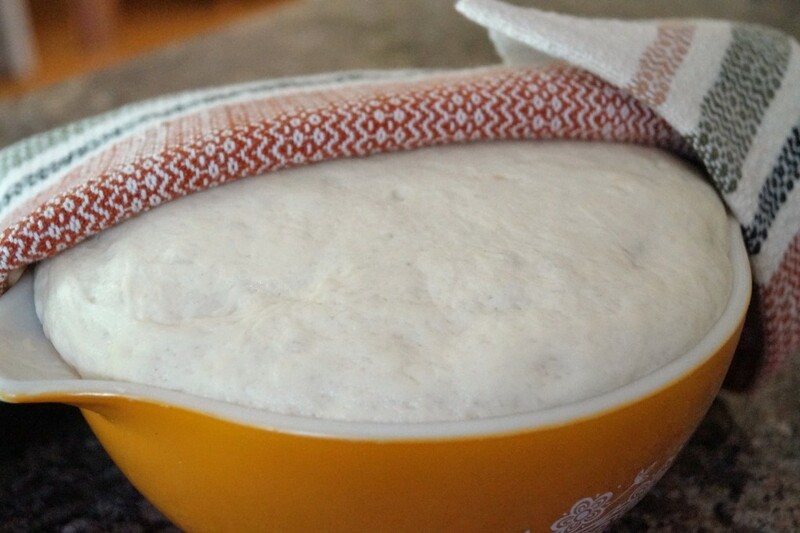 When the yeast has bloomed, add it to the bowl of flour and mix on low until the dough starts to climb the dough hook of the mixer. 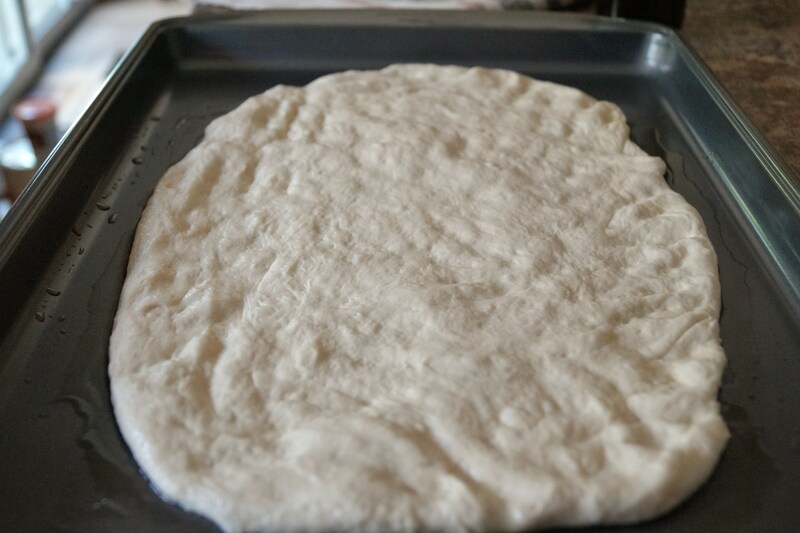 Remove to a floured surface and knead in just enough flour so that the dough is smooth and elastic. Place the dough in a clean bowl and drizzle a tich of olive oil over it, turning it over to cover the dough completely. Place a clean tea towel over the bowl and let rise in a warm place until double in bulk (about an hour or so). 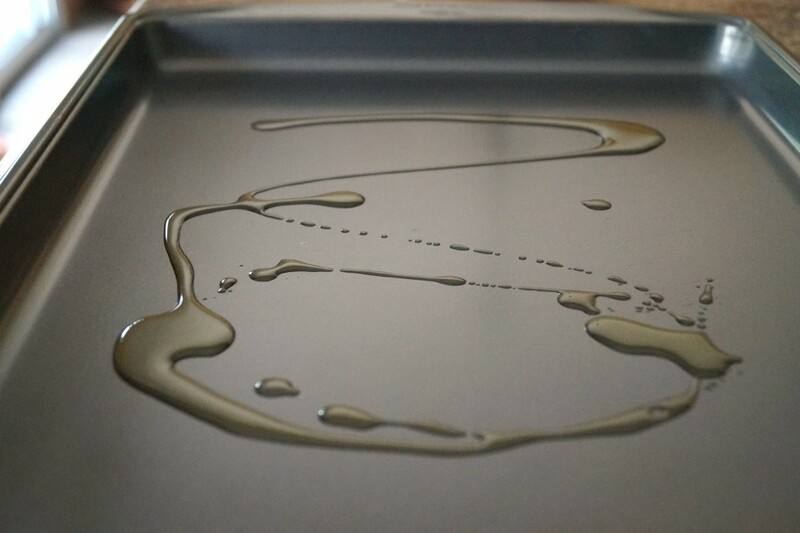 On a large sheet pan, drizzle about a tablespoon or so of good quality olive oil and smear it all over with your hands. 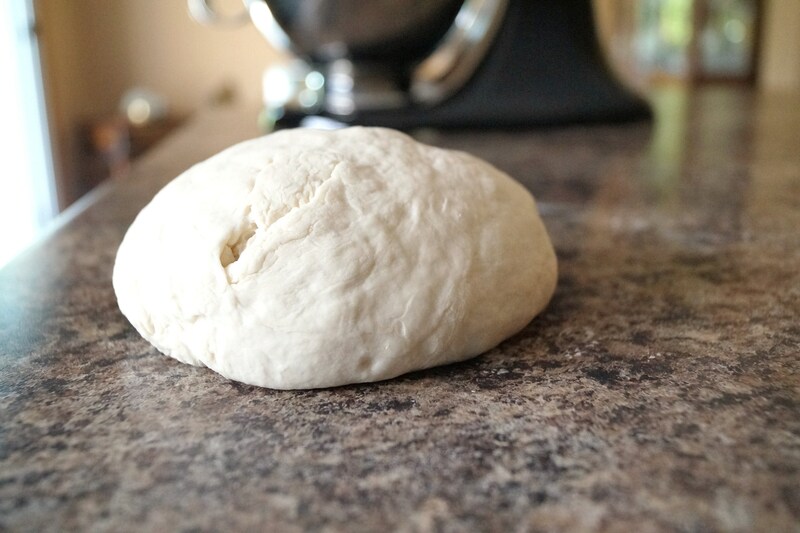 Grab your dough ball and stretch it out to a large rectangle, smooshing it along with your fingertips on the pan. 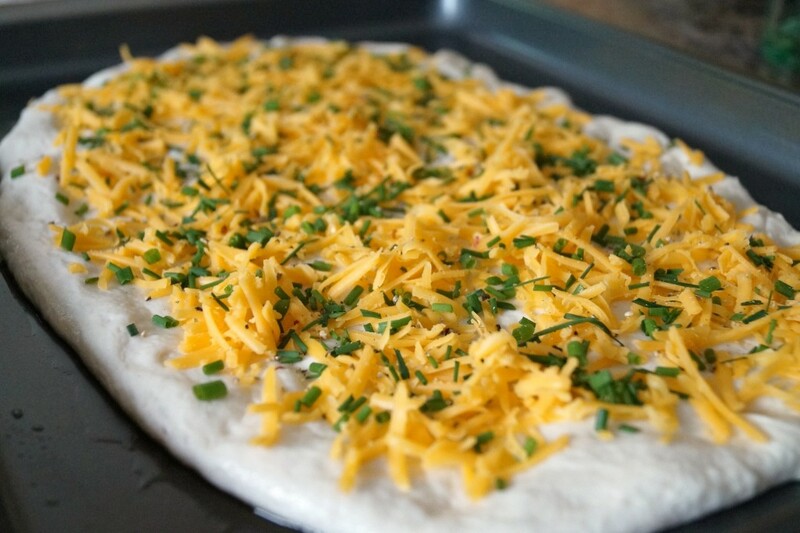 Spread the cheddar cheese all over the dough, followed by the chives and fresh cracked black pepper. Cover with the tea towel and let rest for 20 minutes. While you are waiting, open an ice cold brew and pre-heat your oven to 400°F. 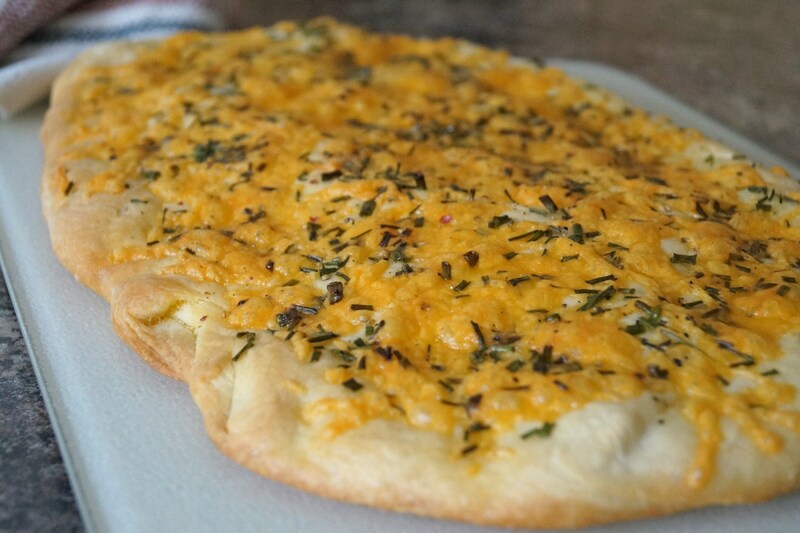 Pop the flatbread into the oven and bake for 20 minutes or until the edges are golden. Watch carefully though so the crust and/or cheese doesn’t burn. Remove from the oven, slice and serve with your favourite cold beverage and praise the return of summer!